The thing that bugs me about most breakfast cereals is the mountains of added sugar and salt. It drives me beyond despair. Let me explain. Firstly, I can never actually work out how much added sugar I'm giving my kids. The packets often aren't clear as to whether it's added sugar that they're listing or total sugar which includes all the sugar from fruits. But let's go with "actually heaps". Way more sugar than is necessary. It's entirely possible to eat your allocated amount of added sugar per day in a (regular sized) bowl of breakfast cereal. Seriously! If you’d like to hear my rant more about added sugar, here’s the simple truth about kids, sugar and salt. Secondly breakfast cereals drive me insane because I don't think it's necessary to add loads of sugar to foods but of course, my kids love them. My kids are like sugar seeking missiles and they adore breakfast cereal. They could eat bowls and bowls without thinking about it. They would happily fill a pail to the brim and mindlessly shovel it into their mouths without a second thought. And here's me trying to teach them healthy eating habits. But I live in the real world with 4 young kids who need to eat breakfast, so what's a gal to do? You know they say that breakfast is one of the most important meals of the day? Well, it's true. Kids and adults need energy to feed those little bodies. Even if you spring out of bed in the morning with a leap, you need fuel to keep you going. Breakfast helps kids to be active and concentrate at school. I want an easy, healthy breakfast that my kids will love to give them all those nutrients to get them off to a good start each day. 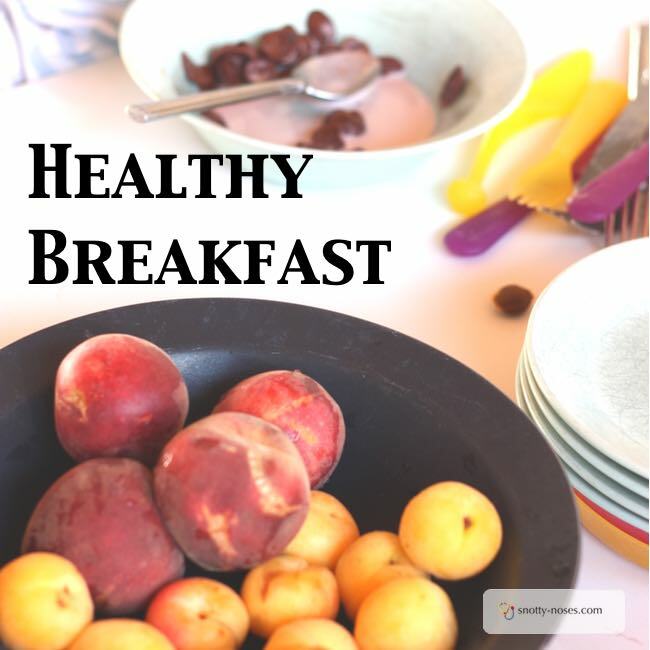 Think of breakfast as another opportunity to offer your children some healthy food. Rather than thinking of breakfast as something that comes out of a box, think of it as another meal. You want the proportions of food types to be the same as all the other meals. In case you’re not sure, here’s what a healthy diet for kids is. What we’re aiming for is lots of fruit and vegetables, with some grains and some protein. Easy Healthy Breakfast Ideas for Every Day. Here are some great ideas to help you adapt your busy ‘everyday’ breakfast into something more healthy. If you’re worried that your kids will be resistant to the new healthy breakfast, then take little steps. Look at your breakfast cereal. Do you have lots of sugary breakfast cereal that is really just a treat in disguise? If you want to stick to breakfast cereal, go with high fibre, low sugar and salt. Things like ‘weetabix’ and bran flakes, or muesli that doesn’t have lots of sugar added. Add raw fruit and vegetables. I often leave a bowl of whole fruit or cut up fruit on the breakfast table and it quickly disappears. Raw vegetables are a great idea too. Cooked fruit and vegetables. My kids love to add some fruit puree to their cereal. I often have some in the fridge, all I have to do is get it out. Cold hard boiled eggs. Eggs are a great way to add some protein to breakfast. Hard boiled eggs are great as you can cook them the night before when you’re clearing up the kitchen and keep them in the fridge overnight. Plain yoghurt. I use full fat no added sugar, you don’t need to restrict calories for kids. Another great way to add some protein. Porridge or oatmeal. Cereal that doesn't come out of a box (so you know exactly how much sugar is in it.) Our favourites are porridge (aka oatmeal) and overnight oats, my all time favourite. Easy and quick healthy recipes. Drink Water. It’s fine to have a small glass of fruit juice but remember that it’s full of sugar. Think of it as fruit with the good bits taken out. Most of what your kids drink should be water. Smoothie, juice or healthy milk shake. We all love a treat in the morning and a glass of whizzed up fruit and vegetables is delicious and healthy. Remember that water should be your main "thirst quenching" drink and that juice is high in sugar (albeit natural sugar) and should be drunken in moderation. What Can I make for Breakfast? Changing habits can be tough, especially when your kids are resistant to new things. I like to count every morning that isn't just cereal from a packet as a success and one small step closer to a healthy diet. It may be cereal with added fruit (a small step closer to "lots of fruit and vegetables"), or homemade overnight oats with no added sugar (a giant leap towards "healthy"). Each step is a step in the right direction. A stop closer to teaching your kids about healthy eating habits and helping them to eat a healthy diet that they enjoy. So my "thing" about breakfast cereal isn't all bad. I wonder if I could get away without ever having to buy it again? I suspect I'd have a riot on my hands! Are you having problems with feeding your toddler a healthy diet? It can be SO frustrating at times. Check out my Feeding Toddler Cheat Sheet and Food Diary, that you can get for free. Just sign up to my newsletter and I’ll send you helpful tips for the most stress free way to teach your kids healthy eating habits from an early age.